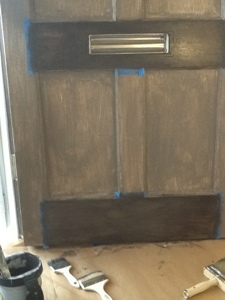 This post is to share a quick tip on updating a door by giving it a faux-wood look in just a few hours. But first a little background leading up to this project. The homes in our neighborhood were built after the war in the late 1940s to early 1950s. A mixture of small 3 and 2 bedroom generic ranches about 900 – 1400 sf. I’ve heard Douglas Aircraft built many of the homes for its employees, both executives and factory workers. A few houses like ours were built by the government for returning veterans. These days many of these houses have been remodeled to update and add more living space as we have. I’ve always noticed the first project nearly every new homeowner does is replace the front door. Not us. 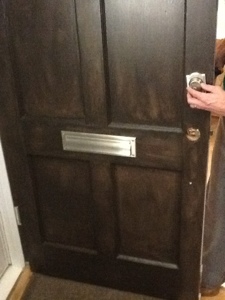 We kept the original painted solid wood door and periodically gave it a fresh coat of paint. Now that the master suite addition is done and the whole house got a fresh coat of grayish green stucco, the plain white front door stood out like a sore thumb. After months of investigating options to replace our door, last weekend on the spur of the moment we decided to stop at the paint store. Having watched countless hours of home improvement shows over the years and getting input from the sales associate, I decided to try creating a wood-look with paint. I bought two quarts of latex paint, one a warm tan color to mimic natural wood and the other a blackish brown to simulate walnut–the thought being if the faux-wood look doesn’t work out just cover it with the dark brown. Here are photos of before, during and after. A summary of the application process follows. -1st step: wipe down the door with deglosser to help the new paint adhere. We prefer deglosser to sandpaper, because old houses have lead paint. If you sand paint, always wear a mask or respirator. -4th step: Apply the darkest color to each of the horizontal sections one at a time using a Chipping Brush (short bushy bristles $1 or so apiece or any old scruffy brush will work-just don’t use a good brush or you’ll get too much paint) going in the same horizontal direction of the woodgrain. Avoid applying too much paint by wiping both sides of the brush off on both sides. Drag the brush straight across the section purposely leaving lines of dark and light to mimic woodgrain. Quickly follow that with another clean dry brush–either another chipping brush (have a lot of these on hand) or I used a large wood staining brush that I already had. Do not dip it in the paint, just press this dry brush over the area always working in the same direction to simulate woodgrain. After painting all the horizontal sections using this technique, remove the painters tape. -5th step: Follow step 4 to do the same process for the vertical sections of the door being careful not to brush over any of the horizontal sections previously painted. I opted not to use the tape this time, but if you want to use it again wait 1-2 hours for the horizontally painted sections to dry. It was easier to do than it sounds. Like anything else, you can make it as simple or complex as you have time and patience to do. Although tankless water heaters provide unlimited hot water throughout the day, there is a limit to how much hot water the unit can generate at the same time. Therefore when buying any type of water heater, tankless or not, it’s crucial to estimate PEAK DEMAND, i.e. how much hot water is used at the same time. Larger homes may require multiple water heaters. For example, two or possibly three people might take showers or baths in separate bathrooms around the same time — typically in the morning — plus a washing machine and/or a dishwasher. Even a small whirlpool or soaking tub requires a significant amount of hot water. 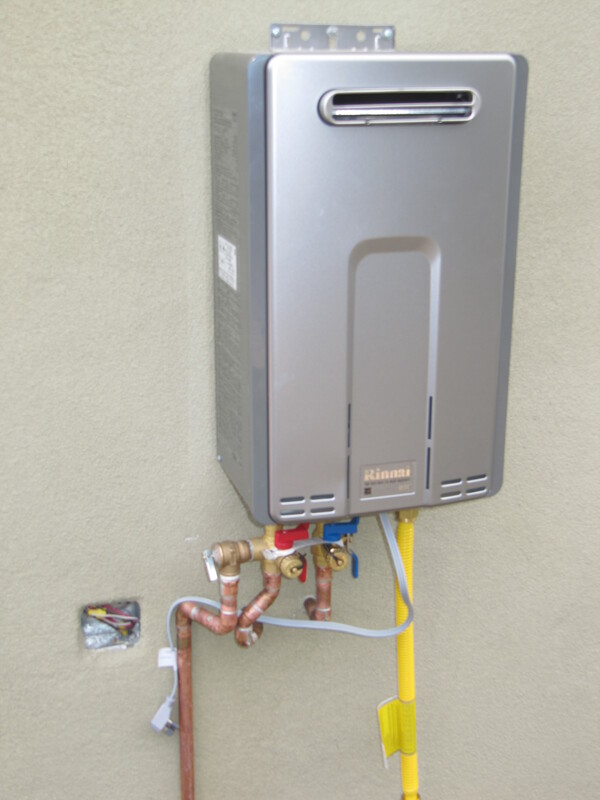 TANKLESS WATER HEATER PROS AND CONS – Here is my short list. Locate any water heater as close as possible to bathrooms. Consumer Reports has a calculation chart for storage tank water heaters that calculates gallons per minute (gpm) to help determine what size tank you need. Other tankless brands include Noritz, Rheem, Jacuzzi and Bosch among others. Hardly a day went by over the years that I didn’t dream about having a second bathroom. 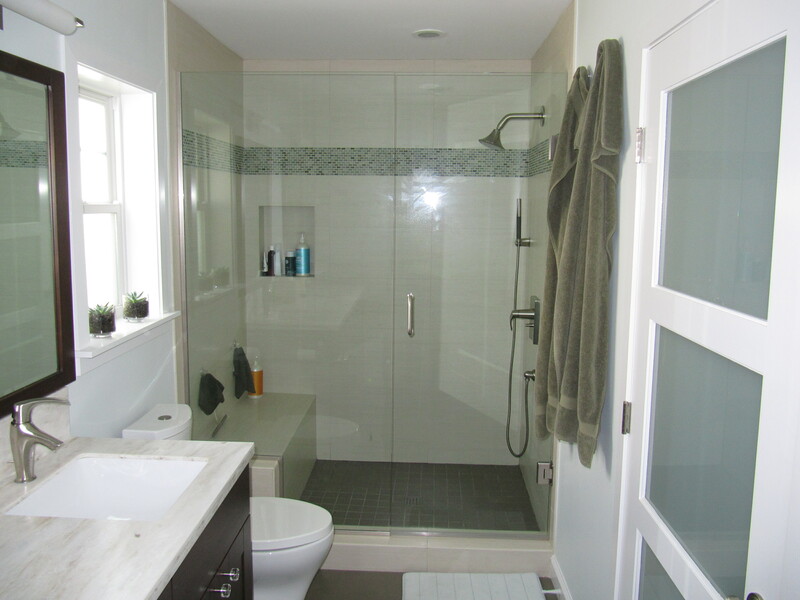 Our existing single 5’x7′ bathroom was gutted and remodeled in 2006, but one bathroom just isn’t enough. When mother nature calls or your work schedules overlap, a second bathroom is an absolute necessity. As we continue to put money into the house, I thought … hey we’re doing our part to help the economy. (Now if I could only find a job that isn’t temporary and pays what I used to make.) Okay, back to reality. Just like every vote matters, so does every dollar spent at this point. So what did we spend our hard earned cash on this month? A gas burning fireplace and new garage door were the major purchases. Here’s what it looks like in our fireplace along with a photo looking up inside the chimney flue after it was relined. The gas log set is relatively inexpensive, however, we had to spend $2k to repair and reline our 60+ year old chimney and a few hundred more to have a gas line installed with a floor key valve shutoff. Yes, the moisture issues finally got worked out and work has resumed on the addition. This was a monumental ordeal, but we worked through it without going crazy (well maybe just a little). We are just thankful that our contractor did his best to remedy all the issues to our satisfaction and continued working to complete this project, well for the most part. In hind sight another good decision we made before starting this project last year was to reduce the scope to just the Master Bedroom/Bath addition rather than also remodeling the kitchen and bumping out the front of the house at the same time. Doing all of that work at the same time would have meant moving out and renting a house or apartment and added significant cost to the project due to this lengthy construction delay. A word of advice, is to do your remodel work in phases. Don’t think you have to do everything all at the same time. Plus now we’re better educated on the process, which should help us make better decisions when the time comes to embark on our next home improvement project. 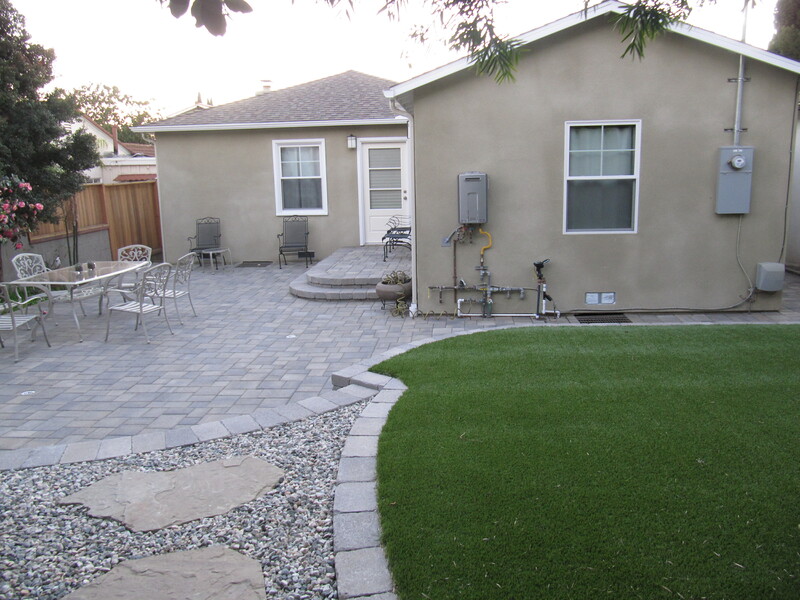 Here are images of work completed over the course of one month (April 2012). It’s so good to finally see some progress again! It’s been one month since the last post, which was spent trying to determine the cause of the moisture problem in our new vaulted ceiling. 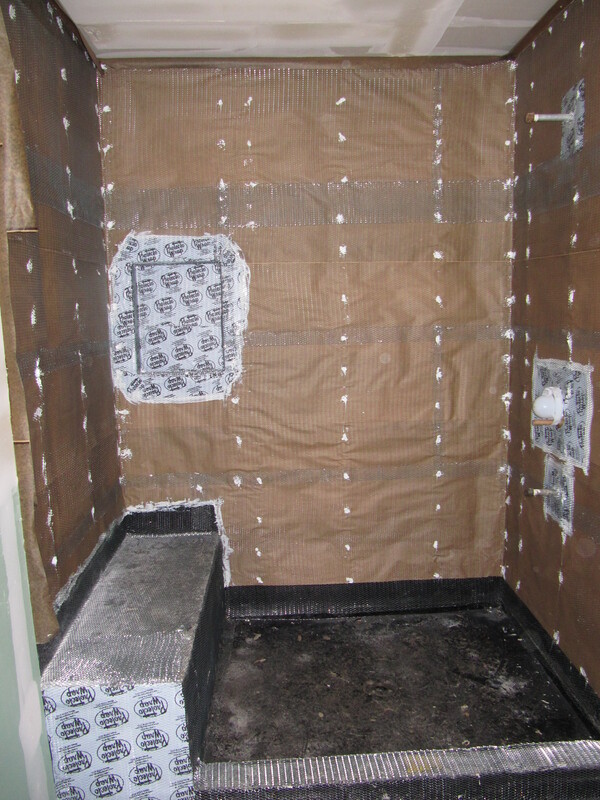 After the roofing company repaired the top section of water damaged plywood and felt, our architect suggested doing a condensation test before closing up the ceiling with drywall. 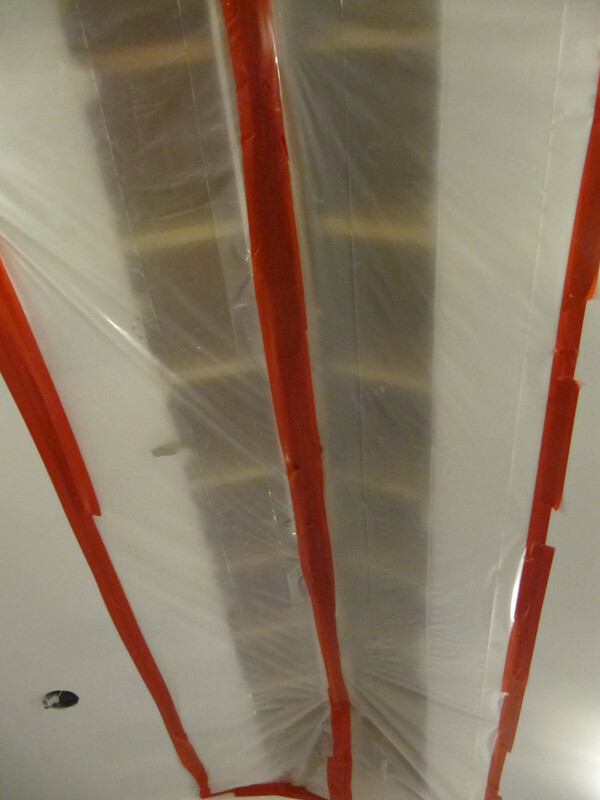 The architect had the contractor cover the open ceiling with plastic and said to watch if any moisture forms. I called this Mud & Mortar week, because there was a lot of both being slapped up. On the interior, drywall mud went up throughout the addition and in parts of our existing house. 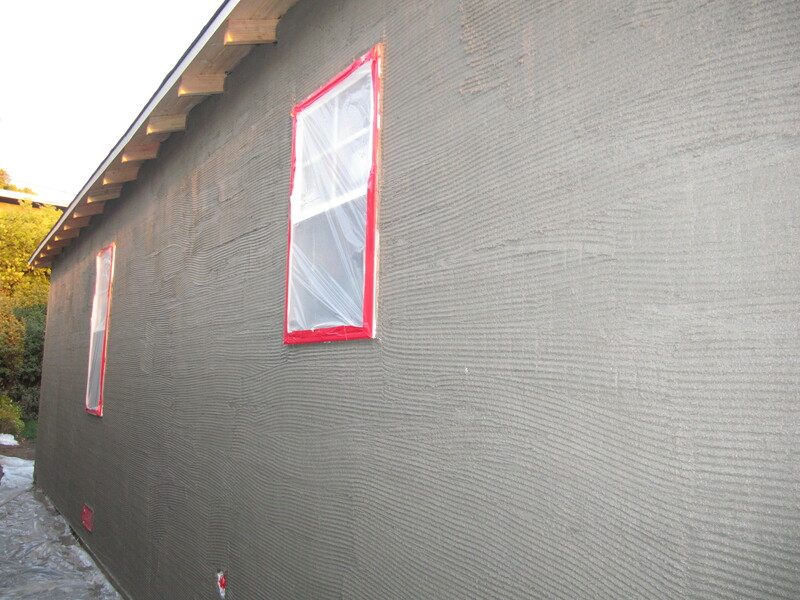 Meanwhile the first layer of stucco, called a “scratch” coat, was applied on the exterior. 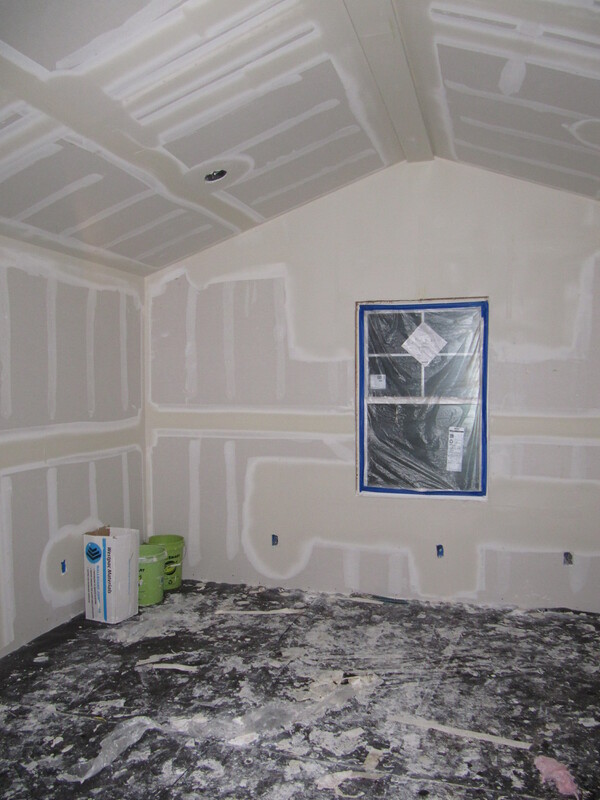 DRYWALL MUD – There’s a ton of it everywhere. In the left photo the area above the window is all mud to level out those cut-out areas with the earthquake straps. In the right photo is looking down the hallway. Didn’t realize they use so much of the stuff. And it all has to be sanded smooth. They wet sanded, but there’s still a lot of residue and dust. Respirators and masks are a must around this stuff. Best just to avoid the area altogether if you can. < THE BATHROOM VANITY goes on this wall. Below the tub got a good dose of mud in and around it that I wiped off before it hardened. And next to it the doors in the laundry room are covered in plastic. 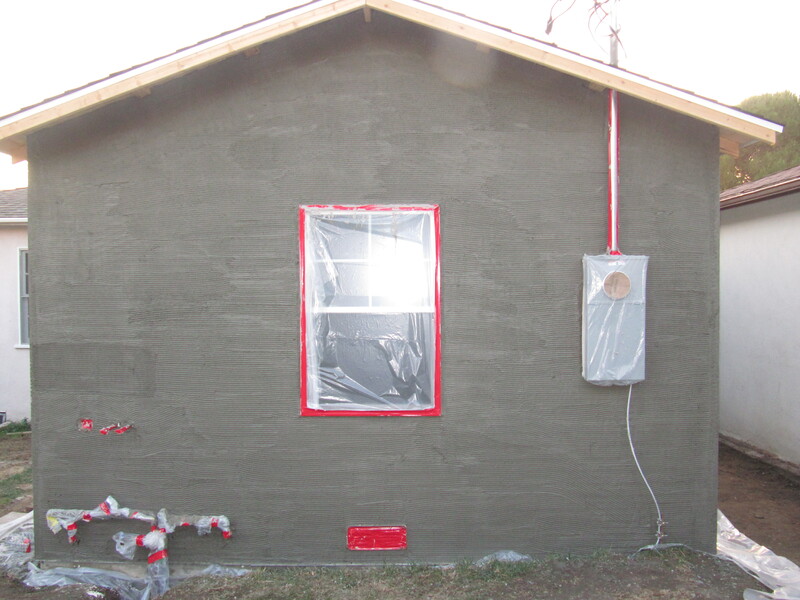 STUCCO – The first “scratch” coat is applied. 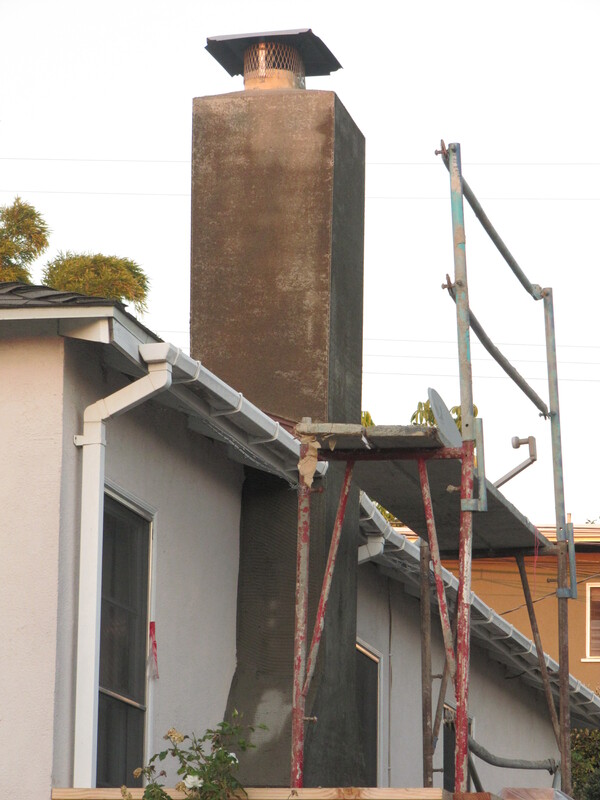 It’s cement on your house, the norm in California. At the last minute we decided to cover up the old brick chimney. 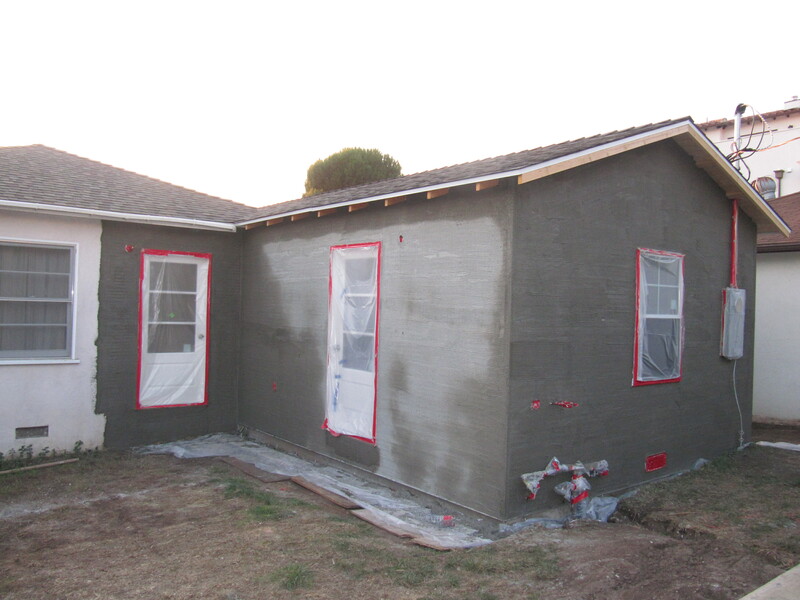 We also decided to restucco the whole house, so that will add a few extra days to the project timeline. Oh well, at least the new and old will be seamless, which you’ll see in a few weeks. After this we took a week off to be with family over the holidays. There was no snow, for which some of us were very thankful, while others were very disappointed. One final task of 2011 was to buy and install locking door knobs, which really made us realize it won’t be long before we get to live in this new part of our house on greenwood. Thanks for following along!